This project is finished. Click on the image to read the Findings Brief. There is a growing awareness of the limitations of existing methods of economic evaluation in capturing the full range of potential outcomes, costs and cost savings of disease-prevention activities. Economic evaluation tends to measure bottom-line measures such as cost-effectiveness and changes in health outcomes, but it undervalues intermediate benefits, such as cultural or institutional changes that occur as a result of the intervention. This project aimed to develop an approach to the economic analysis of prevention programs that is potentially broader than conventional forms of economic evaluation but simple enough to be used routinely. Established guidelines for evaluation that are consistent with the objectives of decision making. 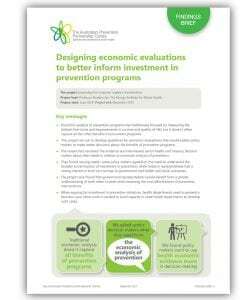 The project produced a guide to commissioning economic evaluations – an approach that will improve the quality and relevance of economic analysis for prevention. Aligning decision-makers’ expectations with how researchers design and undertake economic evaluations should enable investment decisions in disease prevention to be better informed by evidence and to be more responsive to community values. The project developed practical and simple ways to assess the wider economic impacts of prevention interventions, beyond cost and cost-effectiveness. It provided guidelines that allow policy makers to make better decisions about the wider benefits of prevention programs. There is a strong interest from policy makers to use health economic evidence more in decision-making. Health economists don’t always have to broaden economic analysis to make it relevant to prevention. Policy makers’ needs vary according to the policy maker, their agency and commercial imperatives. Some policy makers agreed with the original premise – the need to capture and understand the broader social impacts of investment in prevention, not just the return to the health sector. In some other sectors, such as the health insurance industry, there was a focus on a strict return on-investment framework for investment in disease prevention programs. This strongly influences the type of programs they invest in. Treasury also has a strong interest in return on investment – in terms of both cost savings to government and also social returns in terms of health and social outcomes. The roundtable showed that government representatives need a greater understanding of each other’s needs when assessing the cost-effectiveness of prevention interventions. However, in gaining support for major investment in health from their respective treasuries, health departments need to present their argument in terms of a business case. More work is needed to determine the data requirement for such business cases and to build capacity within state health departments to develop such cases. Centre for Epidemiology and Evidence. Commissioning Economic Evaluations: A Guide. Evidence and Evaluation Guidance Series, Population and Public Health Division. Sydney: NSW Ministry of Health, 2017.